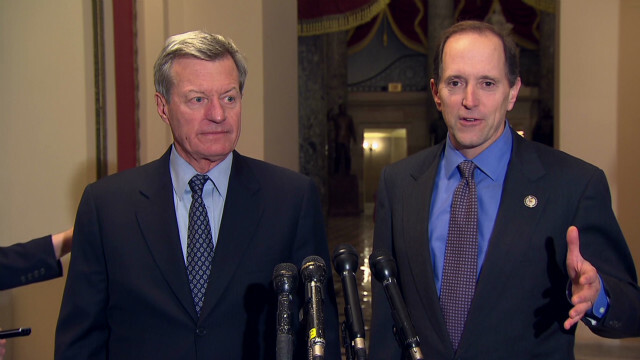 Rep. David Camp, R-Mich., and Sen. Max Baucus, D-Mont. Washington (CNN) -- Congressional negotiators resolved all differences on an agreement to extend the payroll tax cut and unemployment benefits while avoiding a fee cut for Medicare doctors for the rest of the year, leaving only technical issues to sort out. "It's good for the country. It's very good for the country," Montana's Max Baucus, the Democratic chairman of the Senate Finance Committee, said early Thursday in announcing the deal. But resolving those technical issues and getting the necessary signatures required to finalize the conference report was expected to take through at least Thursday. "We're confident that this can be concluded ... and we're moving forward," Republican Rep. Dave Camp of Michigan, the other committee chariman, said. Senate Majority Leader Harry Reid of Nevada hailed the deal. "This bipartisan agreement ensures that middle class families in Nevada and across our nation will not see their taxes go up this year," he said in a statement. "It also guarantees that hard-working Americans looking for a job in this tough economy will not have their safety net ripped out from under them, and ensures that seniors who rely Medicare will continue to be able to see their doctors." The roughly $100 billion payroll tax cut, a key part of President Barack Obama's economic recovery plan, has reduced how much 160 million American workers pay into Social Security on their first $110,100 in wages. Instead of paying in 6.2%, they've been paying 4.2% for the past year and two months. The break is worth about $83 a month for someone making $50,000. The president said earlier Wednesday he will sign the agreement as soon as Congress sends it to him. CMS - Sage Abra HRMS is a Sage Software Select certified Business Partner, providing Sage Abra HRMS software solutions to the North East. CMS has been providing Sage Abra HRMS (Human Resource Management Systems), Recruiting, Payroll, Benefits Enrollment, Training, Time and Attendance, Employee Self Service, and Work Opportunity Tax Credits solutions since 1997. Call CMS Today For a Free Assessment of Your HR & Payroll Software Needs at 1-800-517-9099.